Tapocyon has been found in Oceanside, California near State Route 78 and in Murphy Canyon in San Diego. Tapocyon is an extinct species of a group of primitive carnivores called miacids that lived in North America during the Eocene Epoch. Miacids had characteristics of both dogs and cats, and later this ancestral group gave rise to bears, living dogs, skunks, mongooses, cats, and hyaenas. About the size of a large coyote, Tapocyon's teeth were more like a dog's, but it had retractable claws like a cat. This allowed it to keep its claws out of the way and sharply honed, until they were needed for holding prey, climbing, or scratching. Miacids were the first mammals with teeth highly specialized for shearing and slicing of meat. This was to prove a very successful adaptation for carnivores. Based upon the teeth and the shape of the ear region, this animal appears to be most closely related to later dog-like carnivores, including the true dogs and wolves of the family Canidae. 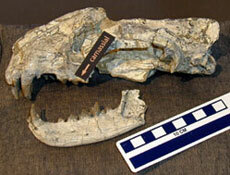 Tapocyon was first described from a jaw fragment collected in Ventura County in the 1930s. 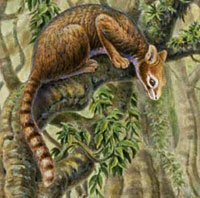 Tapocyon may have been a good climber and probably spent some of its time up in trees. An Inside Look A partial skeleton with a beautiful skull, mandible, and articulated front and back legs was collected by Brad Riney of the San Diego Natural History Museum in Oceanside, California in 1987. This represents the most complete material known of Tapocyon and one of the most complete specimens of any Eocene miacid from North America. When this specimen fossilized, its claws were perfectly articulated in the retracted position, as they were when Tapocyon was relaxed in life. It was found in the Santiago Formation, along with remains of small insectivores, primates, rodents, brontotheres, and oreodonts.